Tested it out, and it worked as advertised. No voyueristic intentions here…. Perhaps 1 feature that would be killer might be a timestamp on the picture. Thanks for testing. I’ll add the timestamp feature request to the todo list. 1 hour! That’s extremely long. 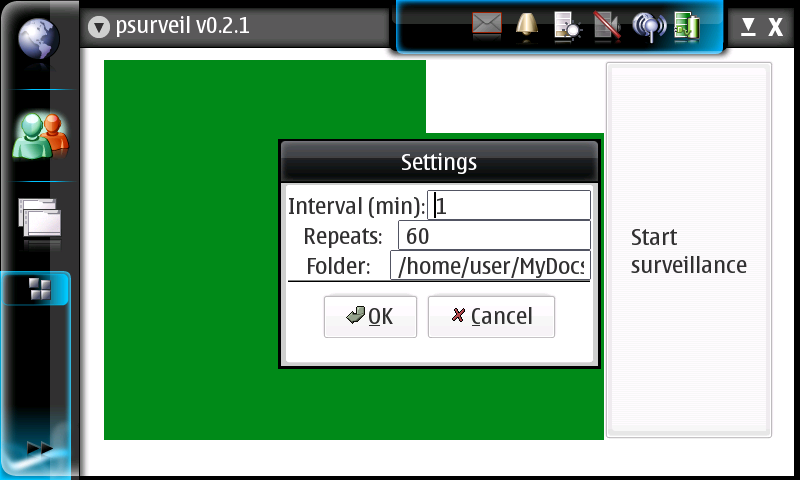 I developed it for and tested it on OS2007, so I don’t know for OS2008. I assume it’s upward compatible. it may be a problem w/ os2008. i read about some neat features on camera 2.7 that are not in camera 3.4 and i tried to install 2.7 on my N800 w/ os2008. no gnumeric and no abiword either. any plans yet to upgrade to os2008 ?